Ministry of Propaganda - 07/May/2004: "Friday Evening Blogging"
Boing Boing links to these pictures of nice cute houses being replaced by huge mansions and asks who enjoys living in these giant houses. I'd say people who think they have to "keep up with the Joneses". People who define themselves by the size of their houses, the latest model of their car and the like. Simple as that. Interesting contrasts: Earlier today I commented quite angrily in Heiko Hebig's entry about Gumball 3000. This evening I find a report about an elderly woman fined for driving too slow. While I agree that driving too slow also creates dangers I think that people who use public roads for races are far worse. The layout is a bit confusing I think, but if it achieves its goals I don't mind: Media Matters for America aims to document and correct conservative misinformation in each news cycle (via the New York Times). ...and one of the things I'm always struck with is how good we are at defending against what the terrorists did last year. We're spending a lot of money shoring up our airlines, we're now talking about shoring up trains. And money that we spend that simply causes the bad guys to change their tactics is money wasted. Very often I hear people from administration saying, "Our policies are working because in the two-and-a-half years since 9/11, nothing else has happened," and I think about it and say, "Well, nothing happened two-and-a-half years before 9/11 either. You did not have any policies. What does that prove?" We worry about what's in the news. I tell my friends that if it's in the newspaper, don't worry about it because it means it hardly every happens. It's news. News hardly every happens; that's why it's news! When something stops being in the newspaper, then worry about it. 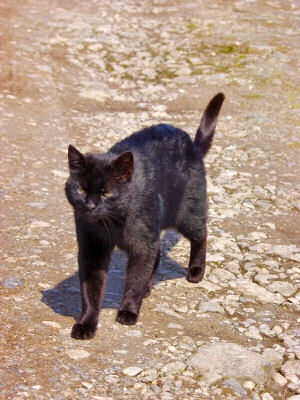 Spammers have found a new way to get past Captcha graphics for webmail registrations. I'm baffled, these people are so creative, why can't they use this energy for something more useful? 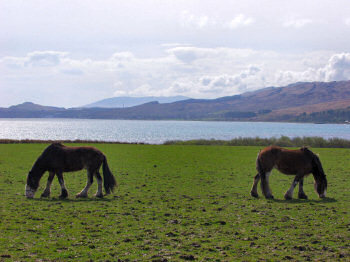 Two horses on Jura. Don't seem to like each other too much, just turning their backs.